(i) Infected lambs – lambs infected with Sheep Measles prior to purchase. Exposure to infected pasture is unlikely to result in more infection, as they will have developed a level of immunity. Note; sheep do not infect other sheep so apart from being eaten by dogs they pose no risk to other stock. (ii) Susceptible lambs – lambs from a clean environment will have little or no immunity to infection, should they be exposed to infected pasture they may develop a high level of infection. Because it is not possible to differentiate between the two categories prior to purchase it is important if you buy in lambs, to ensure that your dogs are free of Sheep Measles worms. If susceptible lambs are exposed to contaminated pastures there may be a storm outbreak of Sheep Measles with large numbers of lambs condemned. 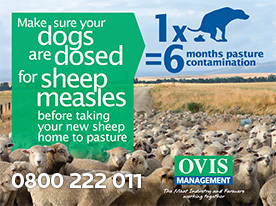 It is important that farms buying in lambs have an effective on farm control programme in place to prevent susceptible lambs developing Sheep Measles Storms. 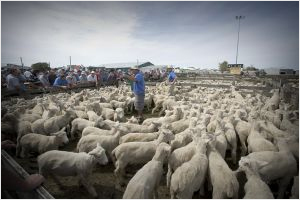 Ovis storms are the result of lambs with low or no immunity being introduced onto infected pastures. Lambs not exposed to Sheep Measles eggs on pastures develop no natural immunity. As a result these lambs are highly susceptible to infection. Should these lambs graze heavily contaminated pastures, the absence of an immune reaction allows many eggs to develop into cysts. The result is an ovis storm with large numbers of lambs heavily infected.